What is popliteal artery entrapment? What are the symptoms caused by this condition? Is the diagnosis of popliteal artery entrapment straightforward? Do I need treatment if I am diagnosed with this condition? The artery supplying the leg with blood passes behind the knee. At this level, it is called the popliteal artery. Entrapment of the popliteal artery is a rare anomaly which occurs during embryonic development. The underlying problem is most commonly the abnormal relationship of the popliteal artery to the gastrocnemius muscle (a muscle of the calf). This drawing shows two different right legs from behind: The drawing on the LEFT (normal anatomy) shows the popliteal artery (in red colour) lying between the two heads of the gastrocnemius muscle, whereas the drawing on the RIGHT (entrapment of the artery) shows the artery having a course around the medial head of the muscle (arrow). Treatment includes surgical division of the responsible muscle. In more rare cases, the artery may be compressed by a fibrous band or by the popliteus muscle. This anomalous anatomic relationship causes popliteal artery compression and may eventually cause thrombosis and occlusion of the artery or aneurysm formation. The use of the knee joint gradually causes intimal fibrosis of the vessel lumen, thereby decreasing flow and causing intermittent claudication (pain in the calf or lower in the leg), numbness or “cold foot”. The symptoms appear when you walk, and much more so if you walk fast or run, and go away when you rest for a few minutes. Popliteal artery entrapment is nine times more common in men. The typical patient is a young athletic man with muscular calves. The diagnosis may not be straightforward. On physical examination, peripheral pulses can be normal in a neutral position, but are not palpable during active plantar flexion against resistance or during passive dorsi-flexion of the foot. Because reduction or obliteration of pulses occurs in over 50% of normal people during active plantar flexion – in which case a duplex ultrasound scan of the artery may give a false positive result – other tests are usually required to establish the diagnosis. Today, CT angiography (CTA) or MRI angiography (MRA) may be performed, while digital subtractive angiography (DSA) has certain indications. Without treatment, popliteal artery entrapment may progress to thrombosis of the artery or to formation of a post-stenotic aneurysm with untoward consequences. In all cases of anatomical popliteal entrapment, appropiate surgical treatment is advisable. 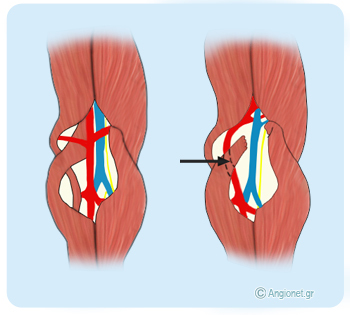 Patients are treated by surgical decompression of the artery with musculotendinous transection (usually by division of the medial head of the gastrocnemius muscle). In case of an occlusion or of an aneurysm, replacement of the damaged portion of the artery with a vein graft will be additionally required. Endovascular treatment is not effective without removing the underlying reason of vessel entrapment, in which case the risk of reocclusion is high.